By Gareth Davis and Media Partner – The Bureau of Investigative Journalism: Some of the smallest councils in England have built up huge debts by buying supermarkets, business parks and offices, tying the future of their public services to the uncertainty of the property market. Councils across England have borrowed massive sums – in some cases the equivalent of ten times their annual budgets – to finance the purchase of real estate, our investigation has found. In the last two years, the number of councils investing in property has doubled. In the past financial year alone, councils spent a total of £1.8 billion on investment properties, a six-fold increase from 2013-14. Of biggest concern is the scale of debts accrued by four of the smallest local authorities in England – including Spelthorne Borough Council in Surrey, which says it is “heavily reliant on investment income” to fund the services it provides. Spelthorne has so far borrowed £1 billion despite having a net annual budget of just £22 million – this equates to 46 times its spending power. Three other councils, Woking, Runnymede and Eastleigh, have borrowed more than ten times their budget. The Bureau has obtained details of the property investments made by more than 100 local authorities. Today we have published the details in full, providing unprecedented insight into how councils are becoming property speculators – with additional details on the millions paid to property and finance consultants. Properties bought by councils include a BP business park in Sunbury purchased by Spelthorne for £392 million; a Tesco Extra bought for £38.8 million by East Hampshire District Council; branches of Waitrose and Travelodge acquired by Runnymede District Council for £21.7 million and a B&Q store that is now owned by Dover District Council. Other acquisitions range from farmland and gyms to a Royal Mail depot and a solar farm. But experts warn that commercial property investments are volatile, and the fact that councils are financing them through borrowing makes them even riskier. If anything goes wrong, the consequences for taxpayers could be severe. “If you look at the most extreme examples, there are public services used by vulnerable people which are dependent on how well rental income in the property market is doing,” said Don Peebles, Head of Policy for the Chartered Institute of Public Finance and Accountancy (CIPFA), which oversees council finance and publishes the guidelines local authorities are supposed to follow. The spending spree has been made possible by councils’ easy access to low-interest loans from the Public Works Loans Board (PWLB), a national government body. There are no limits to how much councils can borrow and they do not have to prove they can afford it – the PWLB leaves this up to councillors to decide. Spelthorne’s £1 billion debt with the PWLB is one of the biggest in the country despite it having one of the smallest council budget in England. The only councils to have larger outstanding loans with the government lender are Birmingham and Leeds, two of the biggest local authorities in the country. Councils like Spelthorne that have become increasingly reliant on this income to balance their books may have left services exposed to changes in the economy. In the event of a crash in the property market, a prospect raised by the Bank of England’s governor in the event of a no-deal Brexit, these councils may struggle to meet their obligations, with potentially major implications for services. In April, the government implemented new guidelines aimed at discouraging councils from borrowing money to profit from investments. The Bureau has found that over 40 councils have invested hundreds of millions of pounds since then, despite the warning. There are also numerous examples of councils investing in property far outside the area they represent. Surrey County Council has spent £70 million on a shopping centre in Worcestershire, while Torbay Council in Devon has purchased a distribution warehouse 230 miles away in Medway, Kent. Broxbourne Council in Hertfordshire, meanwhile, has spent £17 million on a site occupied by Tesco 170 miles away in Grimsby. Surrey council records show that 80% of its investments have been made outside the county. In April, Isle of Wight Council forked out £11 million on an industrial estate in Salford Quays, Manchester, two months after the seller invited offers of £8.7m. The council says that “brochure prices are used as marketing material to attract buyers and don’t necessarily reflect market value” and that the estate was bought through a two-stage competitive bidding process. Ed Cooke, chief executive of retail property body Revo, said private investors had complained that councils were “paying too much” for certain investments but argued they could afford to pay more because the type of financing they could access meant their risks were lower. The Bureau’s investigation has also highlighted a lack of transparency and scrutiny in the decision-making process councils undertake prior to investing in property, and the role of private companies in those decisions. Purchases are typically discussed behind closed doors in meetings where the public and press are not allowed to attend. Key details such as the name and address of the property, who identified it and how affordability was determined, as well as who provided the advice to buy them and how they might be profiting from the advice, are withheld from the public or hidden from sight. How did Spelthorne, a borough council covering the towns of Staines and Sunbury and some leafy Surrey villages, go from having no debt to borrowing £1 billion in less than three years? The council has acquired an extensive portfolio of hugely expensive commercial properties, financed through borrowing. 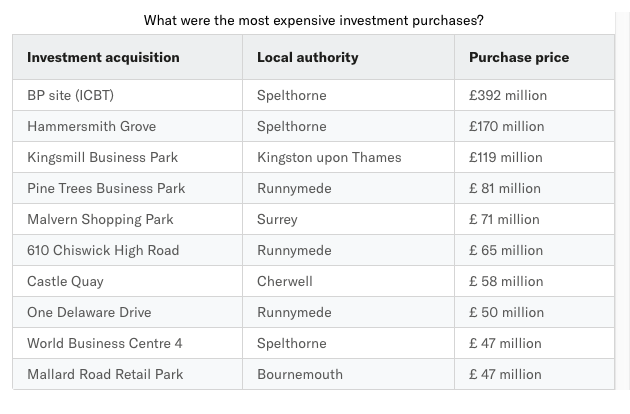 The pace and scale of Spelthorne’s investments are unprecedented. Financial reports from the beginning of 2016 show the initial plan was to borrow just £6 million to fund it’s Towards a Sustainable Future’ policy, which aimed to make the council more self-reliant by acquiring investment properties to generate income. Two months after the 2016-17 budget was agreed, councillors held an extraordinary cabinet meeting and approved an additional £29 million of borrowing to purchase two properties. Fast forward another three months and another unscheduled meeting was convened to approve another £400 million of debt, allowing a BP business centre to be added to the portfolio. The pattern continued, with hundreds of millions more borrowed and spent. Last July, cabinet members reconvened to agree an increase to the council’s debt limit (the maximum amount of debt a local authority can legally owe) – from £600 million to £1.5 billion. Robert Evans, a Labour county councillor for Surrey, said: “People in Spelthorne ought to be worried about this because it’s mortgaging the services they rely on. To date, Spelthorne has bought 12 investment properties to the tune of nearly a billion. Financial reports published last month show these purchases have left the council with annual repayment costs of £26 million – more than its annual budget. However, the council says the annual rental income generated by the assets has reached nearly £40 million, enabling it to put £7.5 million of this commercial revenue towards its annual budget, on top of creating “sinking funds” connected to each of its assets, which it says will “cover future changes in circumstance, such as capital refurbishments or rent free periods”. Spelthorne council leader Ian Harvey, who has a background in property investment, says Spelthorne’s due diligence processes are extremely robust and describes the council’s approach to investments as “restrained, prudent and risk-averse”, despite the vast amount of spending and debt involved. But the council’s auditor, KPMG, which has yet to sign off Spelthorne’s accounts for the past two financial years said the 2016-17 accounts “did not appropriately reflect the significant transactions that took place during the year, such as the acquisition of the BP campus or the drawdown of over £400 million in loans”. The council said this was the result of the departure of both its chief and deputy chief accountants, as well as “some issues with the interim cover”. Last July the auditor also withheld judgement on Spelthorne’s 2017-18 accounts while it undertook a review of the properties the council has purchased. This year’s accounts will be the last ones audited by KPMG for Spelthorne, with the company having been replaced by BDO at the beginning of the current financial year. 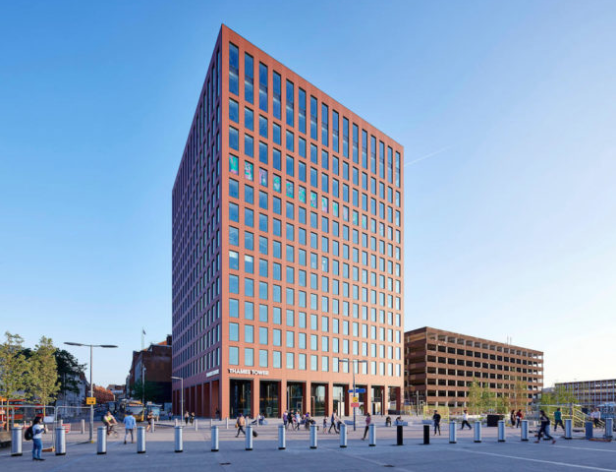 BDO rents office space in Reading’s Thames Tower, which Spelthorne bought in September for £285 million alongside two other offices in the region. In a letter to the authority, BDO said the firm had concluded there was no conflict of interests in the council being one of its landlords. Councillor Evans compared the vast investments made by Spelthorne to when councils across the country invested £1 billion in Icelandic banks before they collapsed in 2008. “I don’t think it’s the role of local councils to be playing the property market with taxpayers’ money,” he said. “The council is massively riding for a fall and people I’ve spoken to are genuinely concerned about it. Analysis of Spelthorne’s public spending data also shows payments totalling £3.4 million to external property and finance consultants. One company, Cushman & Wakefield – a US-based property investment and development firm – has been paid £2.3 million since the beginning of 2017. This is substantially more than any of the council’s other suppliers during the same period. A spokesperson for the company declined to answer a list of questions posed by the Bureau other than to confirm it had provided “property-specific advice on individual acquisitions” to Spelthorne but had not advised the council on its investment policy or borrowing arrangements. Spending records for other councils show that Cushman & Wakefield has also provided services to at least 120 local authorities other than Spelthorne, at a cost of at least £34 million since 2013. However, this data does not include all district councils. The Local Government Association (LGA) says councils have little choice but to look for “alternative” sources of income given the steep cuts in government funding, with the gap between the money councils receive and what they need estimated to rise to £7.8 billion by 2025. “Councils face the choice of either accepting funding reductions and having to cut services as a result, or making investments that can secure those services in the long term,” an LGA spokesperson said. 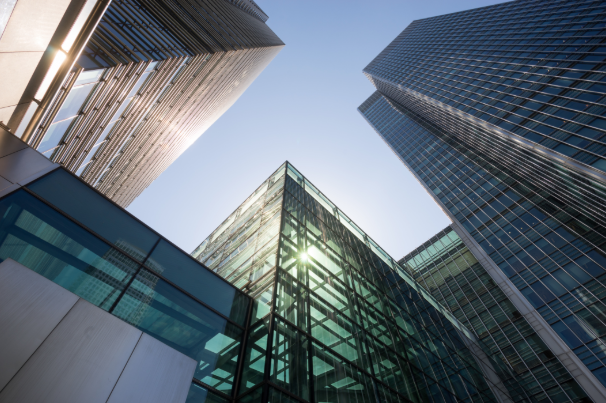 Local authorities are restricted in how much they can raise council tax by without a referendum, and how much they can generate from business rates; but there are no such restraints when it comes to purchasing real estate. The high returns that such investment can yield, combined with easy access to low-interest loans from the PWLB, has made it an appealing option. Local authorities are meant to follow a set of CIPFA guidelines when borrowing money, which caution against becoming dependent on commercial income and taking on too much debt – but the guidance is not binding and it does not include an upper limit on borrowing. Councils can borrow as much as they like, provided they can afford the costs. The decision about whether or not they can afford those costs is left entirely up to them – the PWLB does no assessment of a council’s financial situation before lending the money. The responsibility, it says, lies with “locally elected members of the council, who are democratically accountable to the electorate”. Those councillors are only required to “have regard” for CIPFA’s guidelines. The result is that, while many councils have spent within their means, some have been able to borrow disproportionately large sums without breaking any rules. There are also concerns that outside scrutiny of councils’ spending is much diminished since the Audit Commission was abolished in 2015. A spokesman for the Ministry of Housing, Communities and Local Government said: “Councils are responsible for managing their own finances and making the right decisions for the communities they serve – including making appropriate investments. “All local authorities must properly consider the risks and opportunities before making commercial decisions. Councils making these investments say they are carefully planned and costed arrangements involving reliable tenants on long-term leases. But there are two substantial risks involved, said CIPFA’s Peebles – the fact that commercial investments are volatile, and that the loans being taken out have a very long repayment period. How corrupt is the British government?